This entry was posted on December 12, 2009 at 2:12 am and is filed under 1980's heavy metal albums, 1980's heavy metal bands, 1980's heavy metal music, 1980's heavy metal songs, 1980's metal bands, 1980's metal music, 1981 heavy metal music, 1990's heavy metal bands, Album Review, classic heavy metal albums, cool album covers, creepy album covers, current heavy metal bands, essential heavy metal albums, guitar legends, Heavy Metal, heavy metal album covers, heavy metal albums, heavy metal albums 1981, heavy metal bands, heavy metal bands from england, heavy metal drummers, heavy metal guitarists, heavy metal history, heavy metal music, heavy metal vocalists, metal music, metal odyssey, Music, old school heavy metal, progressive metal, rock music, scary album covers, vintage heavy metal albums with tags 1980's heavy metal albums, 1980's heavy metal bands, 1980's heavy metal music, 1980's metal music, adrian smith guitarist, Album Review, classic heavy metal, clive burr drummer, dave murray guitarist, Heavy Metal, heavy metal albums, Iron Maiden, iron maiden 1981, iron maiden heavy metal band, iron maiden killers album, iron maiden killers album cover, iron maiden songs, killers album 1981, metal odyssey, Music, old school heavy metal, paul dianno vocalist, progressive heavy metal, rock music, steve harris bass guitarist, the ides of march song. You can follow any responses to this entry through the RSS 2.0 feed. You can leave a response, or trackback from your own site. Probably my 2nd fave Maiden album behind Powerslave. 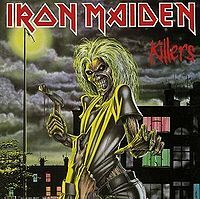 I’ve been on this Iron Maiden kick for about a couple of weeks now. Killers has done it for me again this past week. You know. Plus, Powerslave is unreal – great. The Electric Mummy Rules.